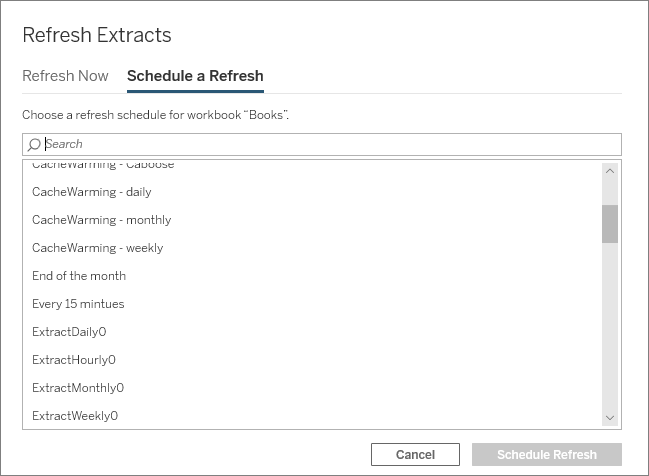 You can schedule refresh tasks for published extract data sources and published workbooks that connect to extracts. Note: When a refresh is performed on extracts created in Tableau 10.4 and earlier (that is, a .tde extract), the extract is upgraded to .hyper extract automatically. While there are many benefits of upgrading to a .hyper extract, your users won't be able open the extract with earlier versions of Tableau Desktop. For more information, see Extract Upgrade to .hyper Format. For information on how to refresh flow outputs, see Schedule a Flow Task. When you’re signed in to Tableau Server, go to Content > Data Sources or Content > Workbooks, depending on the type of content you want to refresh. Note: If you want to add a new schedule, you can do so on the Schedules page.